When you stop and ask somebody how they are doing, what do they normally say? I’m good. Keeping busy. Things are going well. Lots going on. We all find ourselves busy. You ask if they’re staying busy and they reply they’re staying busy. That is all good, and I am all for productivity. I am all for getting things done, equipping people, empowering people, sticking to a plan, and growing your church or your business. The challenge comes when we are so busy, especially as the leaders of the organization, that we don’t stop and take time to think. There is great value in just thinking and creating margin in your life. How much margin or white space is there on your calendar? Throughout your week, your month, your calendar year, how much time is there to just stop and think? We are wired to do; we are trained to do; we just assume that we are hired to do. One of the greatest assets that you bring to your church or organization is not your ability to do things. One of your greatest assets is to think, to problem solve, develop strategies, develop action steps, and create plans. Again, all of that requires margin. It requires taking time to actually think. I want you to eat this frog today. I talk a lot about eating the frog first. Mark Twain said that if you eat a live frog first thing in the morning, everything else through the day is going to get easier. This is one reason why on a practical level, I always do the most difficult things first thing in the morning because after that, everything is a breeze. If I put off the most difficult task until the end of the day, I will probably procrastinate and put it off until the next day. For the purpose of this conversation, when I talk to you about eating the frog first, doing the most difficult thing first, I want you to look at your calendar. 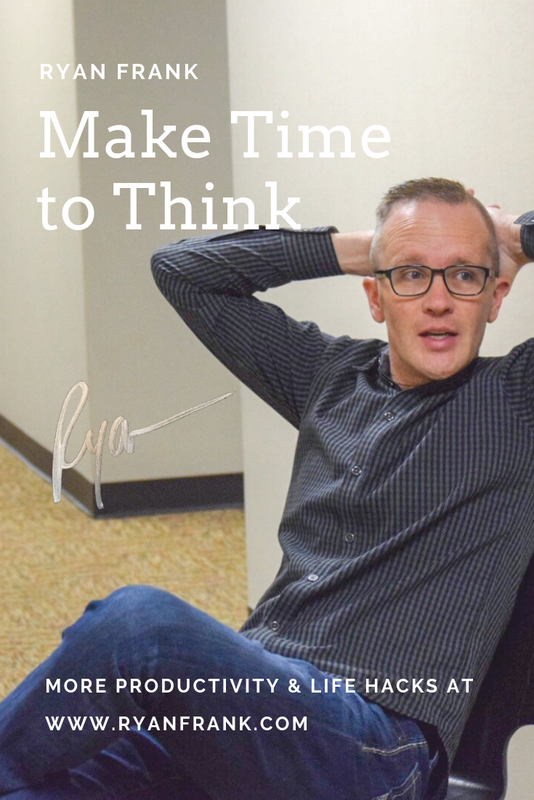 Are you creating time, literally in your calendar, to think? For some of you, you are good at scheduling appointments with everybody else. You just need to schedule an appointment with yourself, so that you’ve got some time to think, to dream; to solve problems; to create products; to come up with advertising and marketing strategies; to prepare lessons and content and training, and growth plans. When we are so busy and we don’t create time to do that, it just doesn’t happen. It’s what Charles Hummel refers to as the Tyranny of the Urgent in his little book by that very title. We get so busy in the urgent things that we neglect the important things. One of the most important things you can do as a leader is to slow down and take some time to think. If I am invited to speak somewhere, if I can drive and be there within four hours, I will drive over fly any day because I enjoy some windshield time. Windshield time gives me time to think. I’ll create times in my calendar every week where I don’t allow any appointments to get dropped in there. I am not going to run errands during that time. I’m not going to set things up; I am going to think. You need to take time and think. It’s one of the greatest assets you bring your organization. It is one of the most important skills that you can develop. Let’s start thinking. Let’s start scheduling time to think, to dream, and to solve problems.